One of the most prominent and trend-setter poet of new Urdu ghazal having a vast following. 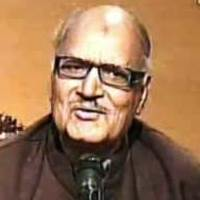 Zafar Iqbal was born in Okara, pakistan on 27th Sep 1933. He is a lawyer by profession and associated with different newspaper as well, where his articles are published regularly. Zafar known for his rare style of poetry, in the genre of ghazal. The diction of his ghazals are entirely different from traditional Urdu poetry that distinguishes him from the rest.